Use your Aqua Painter to wet your watercolor paper. Sprinkle some of the Yellow, some of the Gamboge, and the Brilliant Red Brusho on the paper. Use your Aqua Painter to spread the Brusho around. Let the piece dry. Stamp the trees with Basic Black ink on the Watercolor piece. Let them dry. Use your chalk marker to outline one side of the trees. Let them dry. Stamp the saying on the bottom of the folded card base. 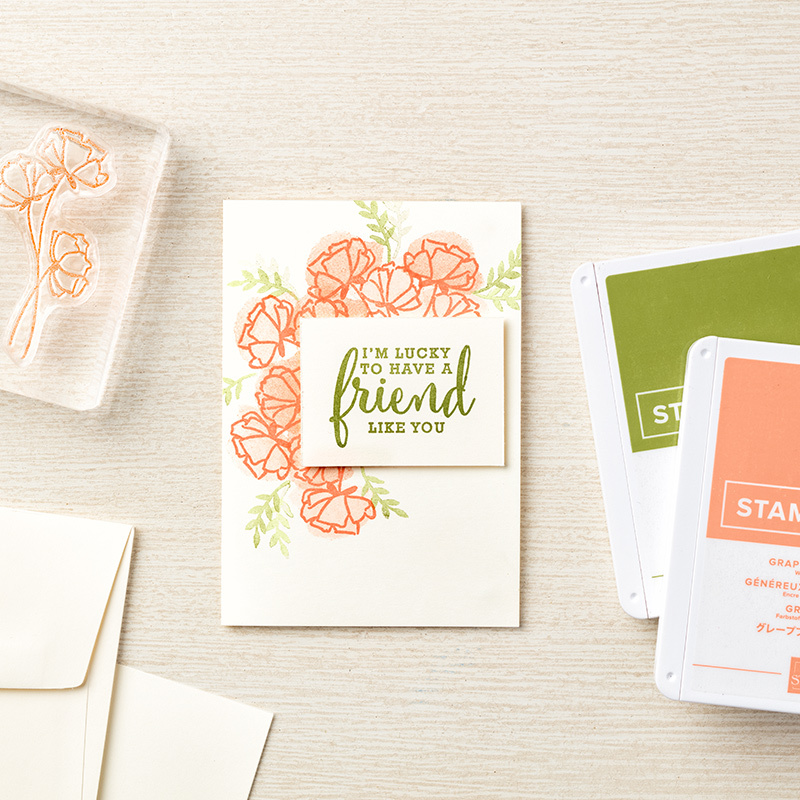 Attach the stamped piece to the Tangerine Tango cardstock and the Basic Black cardstock. Tie the ribbon around the card base and tie into a knot on the right side of the card. Attach the stamped piece to the front of the card with dimensionals. Cut each of the DSP pieces in half diagonally to form 8 triangles. With a pencil, mark the center point of long edge of smaller piece of Whisper White cardstock. Apply adhesive to entire piece. Align one long edge of DSP to center line. Align remaining triangles to both sides of first piece, being sure that entire piece of white cardstock is covered. Turn over and trim excess from back. Adhere DSP piece to larger piece of Whisper White cardstock and then to Rich Razzleberry cardstock. Stamp “thank you” on right side. Adhere 7” ribbon along seam, adhering to the back. Tie 4” ribbon around longer piece in a single knot. Adhere layer to folded card base. 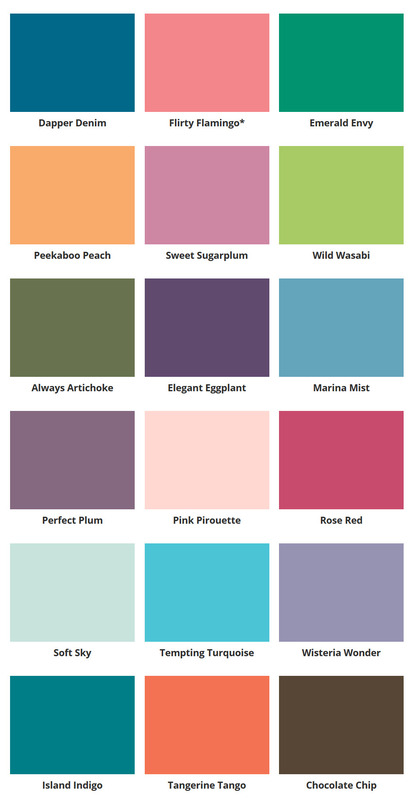 Here are some more beautiful samples using the bundle -- it's on "preorder" through May 31st! I haven't had a chance to play with all my new stuff, but wanted to share a card we made at the OnStage in April! It was made with the Share What You Love bundle! Today's card is a nice mixture of "old" and "new"! I used the Statement of the Heart from the Share What You Love Gotta Have it All Bundle, and paired it with one of my favorite designer papers from the current catalog, Delightful Daisy! I especially love this particular pattern -- the blue and yellow is so bright and cheerful! Tags: charming cafe, heat embossing, petal passion dsp, stamp with tammy, stampin' up! White Baker’s Twine: 12” piece and 5-6” piece. 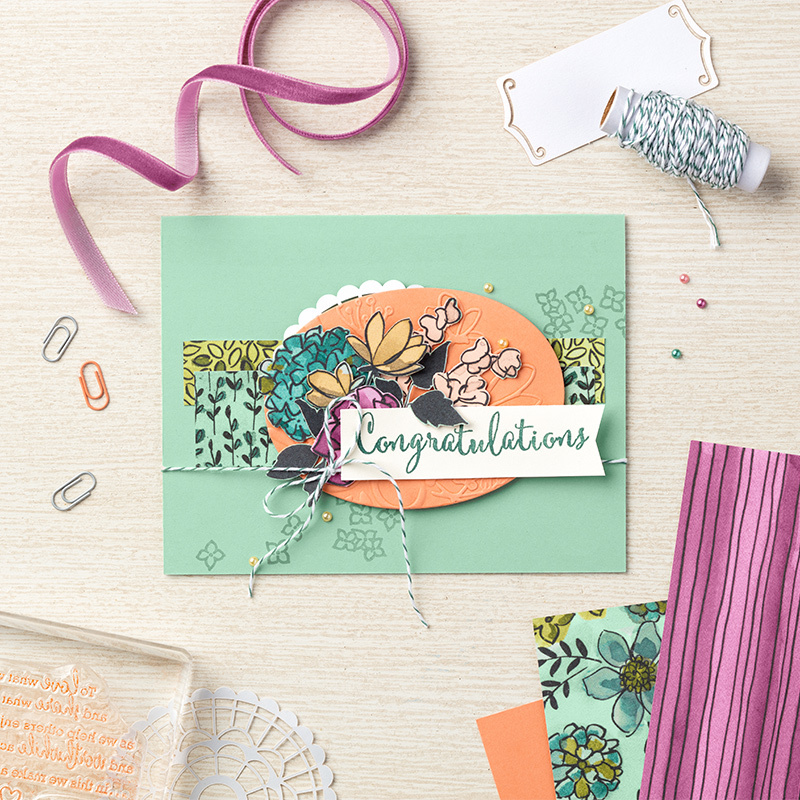 Run So Saffron piece through the Big Shot with the Lovely Floral embossing folder on the top. Adhere to the Basic Black layer with SNAIL adhesive. Using White Craft Ink and a Sponge Dauber, lightly highlight the raised image on the embossed piece. Adhere the Share What You Love DSP to the bottom of the So Saffron layer with SNAIL. Tie a 12” piece of Baker’s Twine around the layers into a double-knot that will hide under the sentiment. Tie a separate Baker’s Twine bow, then attach it to the card front with a Mini Glue Dot. Adhere the tied layers to the Whisper White card base with SNAIL. Die-cut a 2-3/4” wide Stitched Shapes oval from Whisper White cardstock. Stamp sentiment onto oval in Memento Tuxedo Black ink positioned close to the right edge. Stamp the flowers in Memento Black ink, then color in with a So Saffron Marker. Brush each bloom with a little Wink of Stella glimmer. 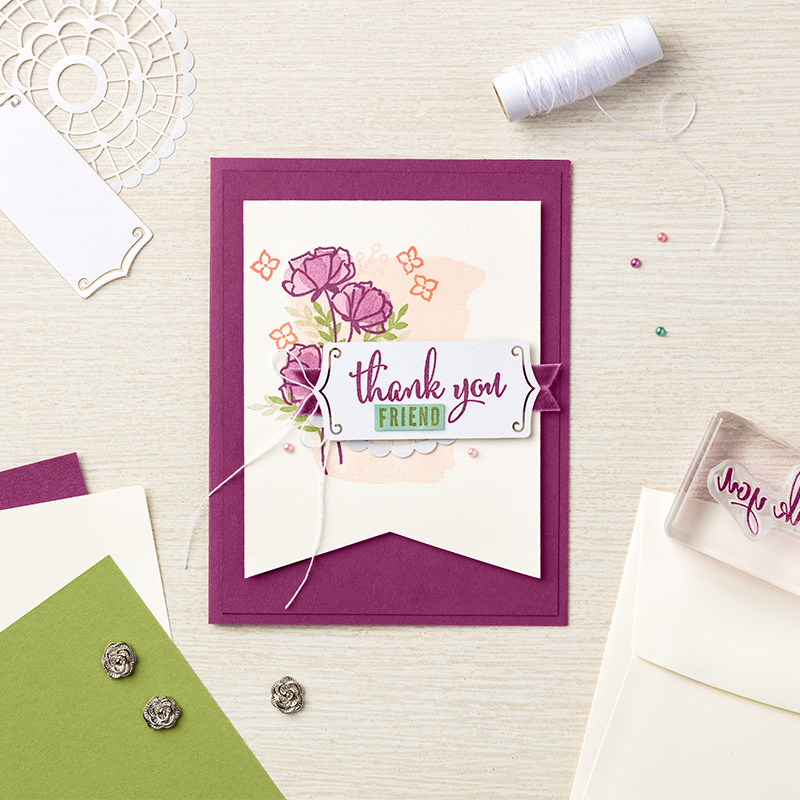 Pop up the sentiment with Stampin’ Dimensionals. Add a few Artisan Pearls floating around the sentiment. 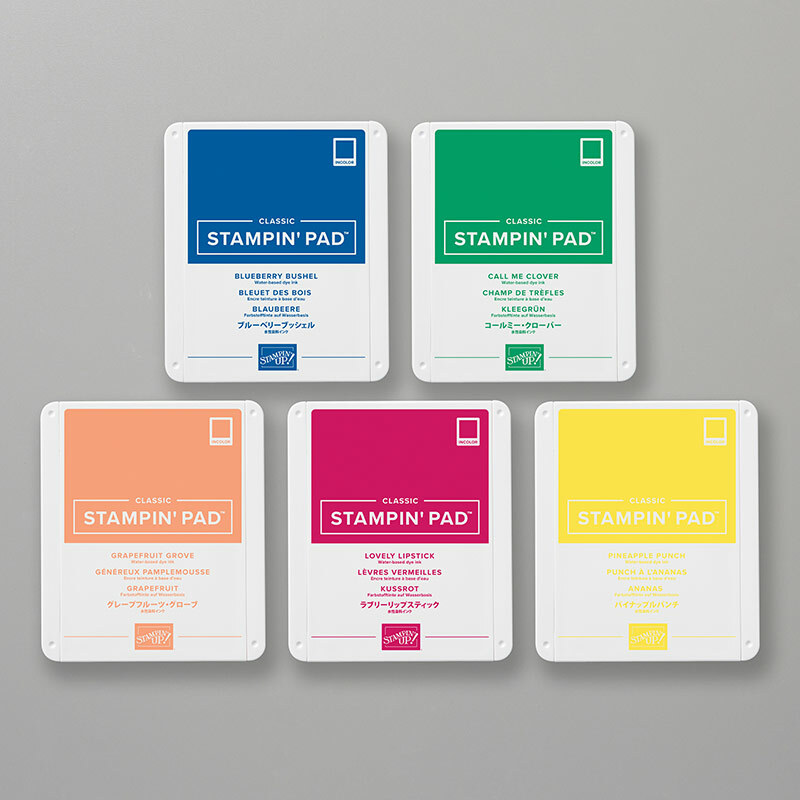 Tags: Love What You Do, Stamp with Tammy, Stampin' Up!